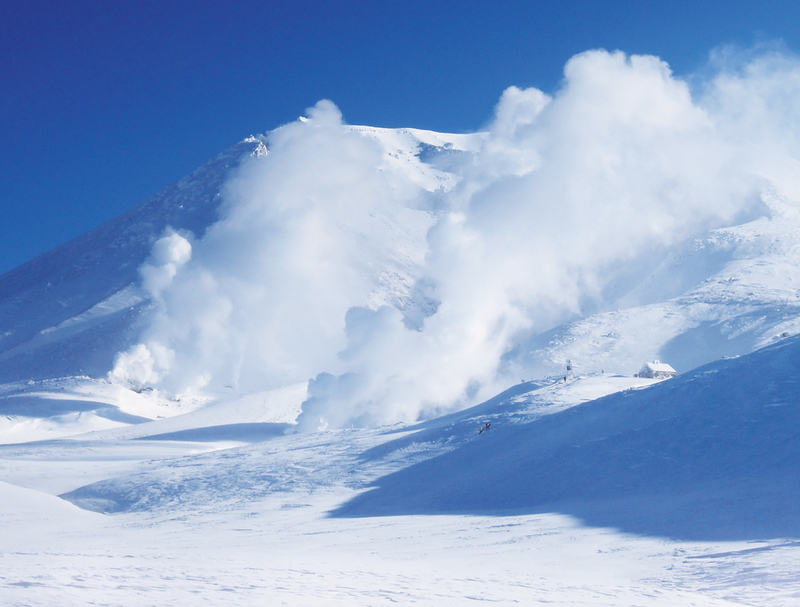 Experienced skiers in Hokkaido speak of a paradise of powder snow. This paradise is the area known as Hokkaido’s Powder Belt, home to the very best powder snow on offer in Japan. This belt region runs along the center of Hokkaido and encompasses the backcountry ski areas of the Daisetsuzan Park that includesKurodake, Asahidake, Mt. Tokachi, Mt. 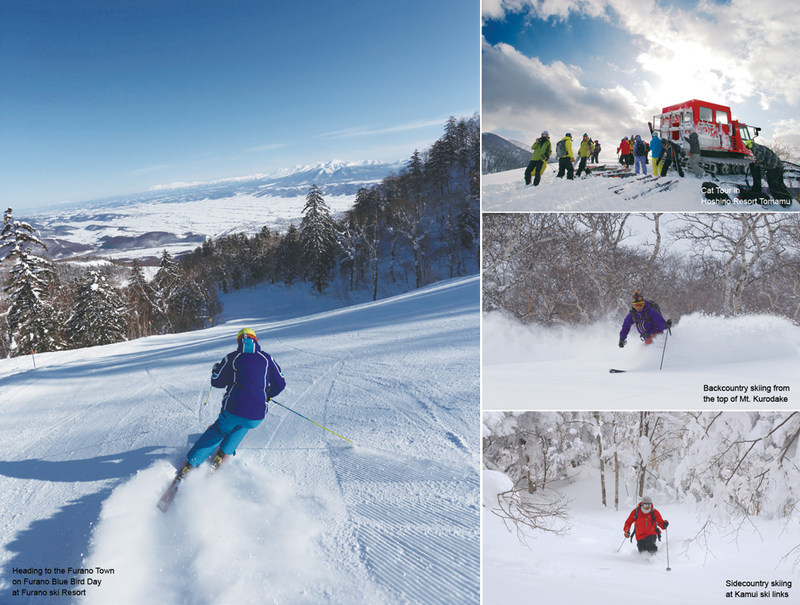 Furano, the Kamui Ski Links, Furano Ski Resort, and the Hoshino Resorts Tomamu Ski Resort. The inland location of the belt region means it has a dry climate, which results in a light powder snow. Have a taste of this powder snow paradise for yourself, by hopping onto one of the many backcountry ski tours and off-piste tours. When snow forms and falls to the ground, building up without melting, it becomes a light, dry powder. The snow here is known as ‘steam’ to the locals for the way it kicks up into the air without resistance in a fine mist of snow as you wind your way down the slopes. Daisetsuzan National Park, a short drive from Furano City, is a backcountry field where this type of powder snow is in abundance. The mountain ranges reaching out from Asahidake, the highest of the mountains in the north at 2,290 m above sea level, to Mt. Furano in the south, are always host to a soft snow. The breathtaking landscape of the active volcano Mt. Tokachi, combined with courses offering powder snow of the highest quality, make for an outstanding backcountry skiing course. And what better way to finish it all off than with a trip to the natural hot springs in the area with their view over the mountains. The term off-piste refers to backcountry skiing that can be accessed immediately from skiing areas. Reached via lifts and ropeways, there is no need to hike out to such areas on foot, making them the perfect place for those looking to take in as much of the powder snow as possible. The off-piste ski areas near Mt. Furano offer some of the highest quality powder snow across the entire world. You can enjoy the best of each of these areas by joining tours led by experienced local guides. Amazing off-piste areas around the Furano Ski Resort such as Asahidake, Kamui Ski Links, and Hoshino Resorts Tomamu, which can be accessed via day trips from Furano, are a must see.